The music of Iraq or Iraqi music, (Arabic: موسيقى عراقية‎), also known as the Music of Mesopotamia encompasses the music of a number of ethnic groups and musical genres. Ethnically, it includes Arabic music, Assyrian, Kurdish and the music of Turkmen, among others. Apart from the traditional music of these peoples, Iraqi music includes contemporary music styles such as pop, rock, soul and urban contemporary. Iraq is recognized mainly for three instruments, the Oud, Iraqi Santur and Joza. The most renowned Oudists are Ahmed Mukhtar, Naseer Shamma, Rahim AlHaj, Sahar Taha and Munir Bashir. Musical theater group in Baghdad, 1920s. Iraqi classical music necessitates some discussion of the social environment, as well as references to the poetry. Poetry is always rendered clearly. Poetry is the art of the Iraqis, and sung poetry is the finest of all. In Baghdad from 760-1260, writers spurned musical notation. The music is melodically modal, and moves in a stepwise motion with repeated notes. Use of the lower end of a melodic range is characteristic, as is the use of silence; one listens through the silence. Following a cadence, the singer moves up to the next range of pitches. An arch shape is discernible, and the work ends in the original mode. Singers of the Baghdad Court were praised for their excellence in composition, their knowledge of history and songs, and their ornaments and innovations. There was support for female singers and orators, such as Arib, a skilled poet, calligrapher, lutenist, composer, and backgammon player who wrote more than one thousand songs. The common instrument (comparable in popularity to the piano or violin in the west) is the oud. Classical Iraqi music is identifiable by the genre/canon, and by how it is performed. Historically, music would have been played for gatherings of men. With the advent of the sound recording industry, things have changed somewhat. Today one invites musicians to perform at weddings; by the first quarter of the century, concerts were being staged at concert venues. Across the Arab world, maqam refers to specific melodic modes. When a musician performs maqam performances, the performer improvises, based on rules. There are a number of different maqams, each with its own mood and characteristics. There are between fifty and seventy maqams, many of which have sub-styles. Other characteristics of Iraqi music include a slow tempo, rhythmically free ornamentation or melodic lines, and predominantly minor modes. Instruments include qanun, riq, santur, darbuka, naqareh, ney, djose and oud. Baghdad's Chalgi ensembles typically include the djoze and ney, and may also utilize an oud. "Lil 'Ashiqi fi-l Hawa Dala'il" by Ahmed Abdul Qadir al-Musili (1877-1941). Maqama texts are often derived from classical Arabic poetry, such as by Muhammad Mahdi al-Jawahiri, al-Mutanabbi and Abu Nuwas, or Persian poets like Hafez and Omar Khayyám. Some performers used traditional sources translated into the dialect of Baghdad, and still others use Arabic, Turkish, Armenian, Hebrew, Turkmen, Aramaic or Persian language lyrics. The roots of modern Iraqi maqam can be traced as far back as the Abbassid Caliphate, when that large empire was controlled from Baghdad. 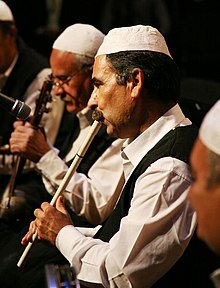 The pesteh, a kind of light song which concludes a maqam performance, has been popularized in the later 20th century, growing more prominent along with the rise of recorded music and broadcast radio. Among the most popular pesteh performers are the husband and wife Salima Pasha and Nazem Al-Ghazali. The most popular modern singers of maqam are Rachid Al-Qundarchi (1887–1945), Youssouf Omar (1918–1987), Nazem Al-Ghazali (1920–1963), Salim Shibbeth (born 1908), Hassan Chewke (1912–1962), Najim Al-Sheikhli (1893–1938), Mohammed Al-Qubanchi (1900–1989), Hamid Al Saadi (1959-) and Farida Mohammad Ali (1963- ). Munir Bashir, an acclaimed oud singer. Omar Bashir, a modern day oud singer. For much of the 20th century, Egypt was the center for Arab popular music, with only a few stars from other countries finding international success. Singers were Muslims, Jews and Christians. Iraqi instrumentalists attended the famous 1932 Arabic music congress in Cairo, which the Muslim vocalist Muhammed al-Qubanchi also attended. In 1936, Iraq Radio was established by two of Iraq's most prominent performers and composers, Saleh and Daoud al-Kuwaity with an ensemble, with the exception of the percussion player. The nightclubs of Baghdad also featured almost entirely Jewish musicians. At these nightclubs, ensembles consisted of oud, qanun and two percussionists while the same format with ney and cello were used on the radio. One of the reasons for the predominance of Jewish instrumentalists in early 20th century Iraqi music was a prominent school for blind Jewish children, which was founded in the late 1920s by the great qanunji ("qanun player") Joseph Hawthorne (Yusef Za'arur) (Hebrew: דנדהי ללוואלד-יוסף זערור‎ Arabic: يوسف زعرور‎). Many of the students became musicians, eventually forming the Arabic music ensemble "Israel Radio" (Hebrew: קול ישראלי‎ Qol Yisraeli ). The most famous singer of the 1930s–1940s was perhaps Salima Pasha. During the 1920s, two brothers began to gain prominence in the field of music in Iraq; the Kuwaiti brothers - Salih, a violin player, and Dawud, an oud player. Almost at the same time, the name of a woman singer, Salima Pasha began to achieve fame. The brothers, Salih and Dawud el-Kuwaiti began to perform and to compose new songs for Pasha. Salih became the most prominent musician in Iraq, and Pasha became the most famous singer. Following the opening of the Iraqi Broadcast Station in 1936. Salih was asked to form the official music ensemble for the radio station. It was due to him, that two instruments, the cello and nay (flute), were introduced for the first time into the instrumental music ensemble. The respect and adoration for Pasha were unusual at the time, since public performance by women was considered shameful and most female singers were recruited from brothels. Numerous instrumentalists and singers of the middle and late twentieth century were trained at the Baghdad Conservatory. In recent years the Iraqi school of oud players has become very prominent, with players such as Salman Shukur and Munir Bashir developing a very refined and delicate style of playing combining older Arabic elements with more recent Anatolian influences. Pop music in Iraq more often than not means musical motifs and lyrics dating back centuries but performed with a mix of traditional and modern instruments. Kadim Al Sahir, for example, may be nicknamed "the Elvis of the Middle East," but he sings in classical Arabic. Popular musician Ilham al-Madfai features the electric guitar and saxophone, but uses the instruments to reinterpret age-old folk songs. Until the fall of Saddam Hussein, the most popular radio station was the Voice of Youth, which used to play the popular music of Iraq to continue the culture of the country. The station also played a mix of rock, hip hop and pop music from artists as far-ranging as Eminem to R.E.M., all of which had to be imported via Jordan due to international economic sanctions, and both disc jockeys and callers spoke exclusively in English. Irish bands The Corrs and Westlife were especially popular. Iraq also produced a major pan-Arab pop star in exile in Kadim Al Sahir, whose songs include Ladghat-e Hayya, which was banned by Hussein for its racy lyrical content. 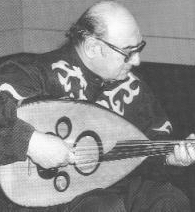 Other modern Iraqi singers include Ali Al Essawi, whose song Makhtuba became huge hit in the Arab world and made him famous throughout the region. Major artists include Shatha Hassoun, Rahma Mezher, Majid al-Muhandis, Hussam Al-Rassam, Rida Al Abdullah and Iraq's very own boy band Unknown to No One, as well as Acrassicauda, Iraq's first heavy metal band. There are also ethnic Assyrian singers such as Klodia Hanna, Ashur Bet Sargis and Linda George as well as a number of Kurdish, Turkmen, Yazidi, Dom and Armenian musicians such as Seta Hagopian. Since the 2003 invasion of Iraq and fall of Saddam Hussein, some militant extremists have been attacking musicians, especially those in the port city of Basra, where the Wahabis are believed to be responsible.Basra's sea shanties are well known throughout Iraq. Music shops in the Summar district have been the target of grenade bombings. Extremist religious leaders have closed some of the concert halls and clubs in the city. ^ a b c Kojaman, Yeheskel. "Jewish Role in Iraqi Music". Retrieved 2007-09-09. ^ Manasseh, Sara (February 2004), "An Iraqi samai of Salim Al-Nur" (PDF), Newsletter, London: Arts and Humanities Research Board Research Centre for Cross-Cultural Music and Dance Performance (3), p. 7, archived from the original (– Scholar search) on December 2, 2005, retrieved 2007-09-09 . BBC Radio 3 Audio (60 minutes): Iraq's classical and gypsy music traditions. Accessed November 25, 2010. BBC Radio 3 Audio (60 minutes): Ilham Al-Madfai. Accessed November 25, 2010. Sephardic Pizmonim Project by Jewish community of the Middle East.